For those who have little idea how to attempt academic task 1 in IELTS exam, I’ve developed a strategy. As you guys already know, I never give answers. I believe in motivating students to write their own answers using hints given in my blog posts. So, here’s a unique way to learn more about writing academic task 1. Look at the line graph given below and answer the questions. The graph below shows average carbon dioxide (CO2) emissions per person in the United Kingdom, Sweden, Italy and Portugal between 1967 and 2007. Instructions: please fill answers using hints given in parenthesis. You can use adverbs and adjectives such as gradually. Where more than one options are given in brackets, they’re meant to use different words at different places (vocabulary angle in IELTS). The given line chart presents information on the amount of ………………………….. (emissions) in …………. countries – …………… , ………… , ………….. and …………. – during a span of …………. (from ……… to ………….). During ………………………………….. (years), despite ……………………………. (fall/decline/drop/decrease) in …………………… (emissions) from ………… in 1967 to ……….. (metric ton) in 2007, the United Kingdom remained ……………………………….. (largest/biggest) of carbon dioxide among ………………………………….. (nations). Though, Portugal remained …………………………………………………… (smallest/lowest) except in …………….. , its …………………… (emissions) from ………. to ……….. (metric ton). From ………. to ……… (years), Sweden‘s emissions ………………………….. (rise/swell/surge/ increase/grow/climb) to about ………. (metric ton). Thereafter it …………………………………… (fall/decline/drop/decrease) till ……….. (year). Carbon dioxide emission in Italy ………………………….. (rise/swell/surge/ increase/grow/climb) throughout …………….. (year) from ………. to …………. (metric ton). It is also evident from the chart that while U.K accounted for …………………………………… (times/percent) of that of Portugal in …………….. (year), the gap narrowed and U.K accounted for about ……………….. (times/percent) that of Portugal’s emissions in …………. (year). 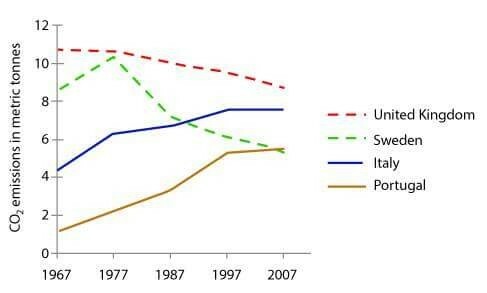 The gap between ………………………………… (emissions) of U.K and Italy was ………… (metric ton) in ………. (year) and this gap narrowed down to just ………………… (metric ton) in ……….. (year). Overall while ……….. and ………… (countries) witnessed …………………..(fall/decline/drop/decrease + emissions) during ……………….. (years), …………. and …………. witnessed …………………………. (rise/swell/surge/ increase/grow/climb + emissions). It is also evident from the chart that while U.K accounted for …………………………………… (times/percent) of that of Portugal in …………….. (year), the gap narrowed and U.K accounted for about ……………….. (times) that of Portugal’s emissions in many years(year). The gap between the flow or progress (emissions) of U.K and Italy was of huge amount (metric ton) in past (year) and this gap narrowed down to just few numbers (metric ton) in last years. (year).